Timing Accuracy Note: All IDX Timers & Display Timers have quartz timing accuracy of .05% and are therefore guaranteed to have a maximum error of 0.12 seconds over a typical 4 minute wash cycle. Weights & Measures Sinage Note: All IDX Display-Timers satisfy Department of Weights & Measures requirements to scroll both the starting price and the amount of service time that is provided for that price. Same features as the AT300 plus the “Two Time” option for combo vacuums, air / water machines or for specials. Can use two plug in displays (part#: AT300DB-3S7). The AT300-QUAD model has 4 separate 5 AMP outputs with 1 coin input. Great to reduce costs on a vacuum island or other projects. Can use two plug in displays (part#: AT300DB-3S7). 3 – Seven Segment Display for the IDX Model AT300 Timer. Last Alert horn powered by a voltage range of 9-40 VAC/VDC connected through red and black wires. Includes an “L” bracket for mounting. 24VAC Accumulating Plug-In Timer, changeable by 1 sec per coin settings. Short circuit proof output. (Uses DS511 Socket). The AT402 replaces the OBSOLETE AT401D. THESE OPTIONS ARE FACTORY INSTALLED ONLY AND CANNOT BE FIELD INSTALLED. -L Auxiliary output alert plus auxiliary output for coin counter. Last Coin Alert, 1 output for light and 1 output for 24VDC horn. -X Optional output for X-TRA Time – Extends 20 second period after Service Time has expired for customer to deposit additional coins for extra time. Auxiliary output will pulse light 20 times for visual indication. Last coin alert horn capable of being powered by multiple voltages: 9 – 34 VAC/VDC. 2 year warranty. Last coint alert horn (plug-in type, uses DS508) D/C type. Used with AT402-L.
Last coint alert horn 24 VDC type. Same as LC521-DC but without the plug-in housing. Blow down timer for automatic car wash that can be activated by treadle switch, thermostat, or timer in self service bays. Size: 5.375″L x 3.563″W x 1.75″H. 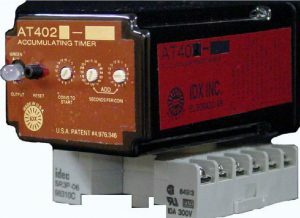 The IDX AT411E series of accumulating timers can be used in vacuums or bays. 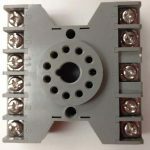 This series of timers can operate either on 120VAC or 24VAC and switch out either voltage. Operators can field adjust time and or coins to start. Size: 5.375″L x 3.563″W x 1.75″H.